A few years ago, Rehab members Demun Jones and Danny Boone went their separate ways and released their solo debut albums. 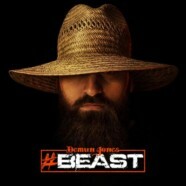 Boone released Fish Grease while Jones released country rap album Jones County and he’s back with the follow up- #Beast. #Beast follows in the steps of it’s predecessor in that some tracks are very upbeat and party tracks while others are a little slower and more serious. Tracks like “Bronco,” which features up and coming rapper Jelly Roll, “The Pit (featuring Big Smo)” and “Highway In My Blood” are perfect for the party, smoking that joint or cruising down the highway. “Give Em Hell” and “Suge White” are upbeat but also slow it down too with “Give Em Hell” featuring The Lacs and Jones’ Rehab partner Boone and sees the instrumentals sampling “The Muddy Muddy” from Jones’ debut record. Lyrically, Jones is right on point. This is some of his best writing and it’s one hell of a follow up to Jones County. In the end, Demun Jones continues to prove why he’s one of the strongest rappers in the game right now- and one of the most underrated too. If he continues to put out music like the material on #Beast, there’s no telling where things can go for him.